The Peercoin Development Team wanted to put out a teaser for the new v0.6 reference client that is currently under development. 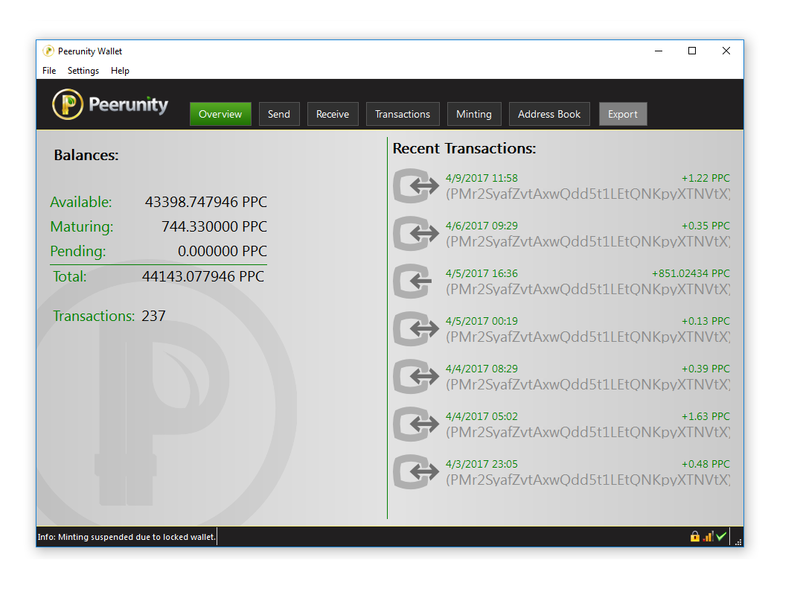 As you may have heard, the Peerunity wallet will no longer be supported after v0.6 of the protocol is released. We’re currently working on moving functionality from Peerunity over to the main Peercoin reference client. As part of the transition process, we’ll be retheming the reference client to reflect Peercoin’s updated visuals and logo. @Sentinelrv took the previous Peerunity theme and updated it with a brighter and simpler looking design. Some inspiration for the minimalist design was taken from our new Discourse forum. For comparison, here is a screenshot of the old Peerunity theme. The migration of Peercoin to the Bitcoin v0.8 codebase has been successfully tested on testnet. The team is now discussing some protocol upgrades like porting over some newer Bitcoin OP codes such as OP_CHECKLOCKTIMEVERIFY. Peercoin surpasses $1, the highest price in nearly 2.5 years. Indicium, a DAC focused on building cryptocurrency index funds, began its first round of funding. Indicium will use the PeerAssets protocol on the Peercoin blockchain and will act as the first financially driven PeerAsset. Funding has already reached $100k with a $250k cap and several weeks left before closing. The Series A announcement and business plan can be seen here. Mercator Atlas, the block explorer of Mercator currently indexes the entire testnet chain in <50MB database, with room for improvements. Atlas currently exposes the needed functionality to continue the implementation of PeerKeeper. Public testing of PeerKeeper to be expected later this year. PeerAssets RFC-0005 for on-chain voting protocol specification has been completed. This protocol will allow decentralized, trust-less on-chain voting and polls using PeerAssets protocol. So how do you guys like the updated theme? It’s in the same format as the old client, but all the colors/logos have been changed as well as it being brighter and simpler looking. I’ve been waiting a little bit to see people’s reactions. Any comments or feedback from anyone? The new design is good, but I do think the text colour is washed out amongst the background. Maybe we can try darkening the text a little bit more. The background needs to be a bit darker but over all it looks good maybe add some green outline color to the big leaf with the inner steam being gold or not just a thought hehe. Great work Dev team keep it up Peercoin is King and the Sun will always rise. I agree. The new logo is too bland, IMHO. Not everyone is going to like design changes as they are subjective opinions. I remember when we first released Peerunity some people complained it was too dark and now some complain the new design is too bright, while others think it’s just right. Lots of others prefer the minimalist design and logo while others think it’s too plain. 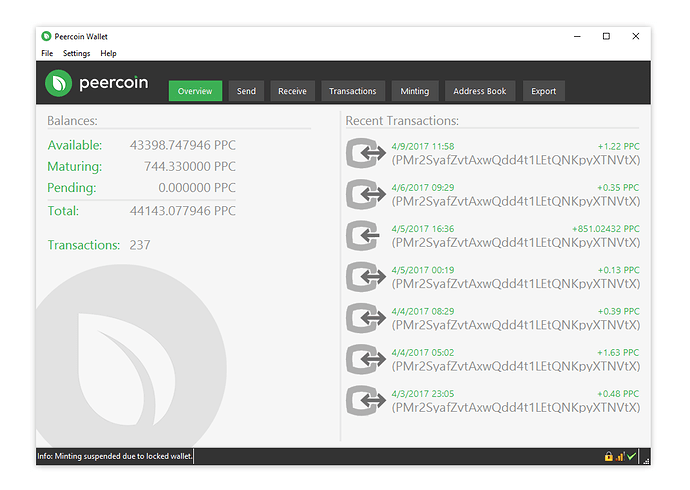 Our new web designer @kazzkiq was actually first interested in Peercoin because of the minimalism we chose in our design. I’m just pointing out the fact that it’s impossible to please everyone when it comes to design choices, as people’s tastes are very subjective. Some prefer light, others prefer dark. Some prefer simple, others prefer complex. This is the direction that we’ve decided to move in as a team and we would like to keep Peercoin’s branding consistent when it comes to the visual experience our users have across our ecosystem, whether it’s our various websites or our software. We’re always open to feedback of course, but just know that we’ve chosen a particular visual direction to move in. From what I Understand, Qt5 will make it possible to customize your client, so changes can always be made by the user if they happen to prefer something other than the default theme. When you design the new menus in the wallet can you pleases have in mind people that are on touch screen devices? I am using the peercoin wallet on my Microsoft surface pro 4 windows 10 pro tablet without a typecover and I find that the menus (the words) are too small for touch screen navigation. It works but it is apparent that the wallet has not be designed for touch screens. The might be some setting on the tablet to increase menu size but I have not been able to find it yet. Thanx. Updated theme is better by far. It looks a lot cleaner. Hope to see context sensitive help when the cursor is moved over the various areas. As a new person to Peercoin, very confusing to find out what the difference was between: Available/Maturing/Pending; along with other items. The pull-down help menu was useless as well on the current unity wallet. Hopefully, testing this with a noobie, not a senior dev. I’m sure you’ve seen the Exodus wallet. That’s what is possible when you keep core programmers away from UI design. As always, keep up the great work! Thank you for keeping Peercoin moving forward.